SECONDARY school pupils across Glasgow will be drawing inspiration from the local environment over the coming weeks as an art and design competition organised by St. Enoch Centre gets underway. Pupils from six of the city’s secondary schools will take part in It’s My Greener Glasgow – a competition launched by St. Enoch to encourage youngsters to think creatively about environmental issues affecting Glasgow. It’s My Greener Glasgow follows on from It’s My Glasgow – a competition run by the Centre in 2009 and 2010 which saw primary and secondary school pupils produce art work on the subject of Glasgow city centre. Talented teenagers from each of the schools are being invited to produce a piece of art or design work with a green or environmental theme, to be submitted before the end of the school term. Each school will be allocated a gallery space in the Centre to exhibit their work from 27 June – 28 August, with shoppers being given the opportunity to vote for their favourite pieces. An expert panel of judges, together with the public vote, will determine the winners of the competition. Winners will be announced at an official award ceremony held at St. Enoch Centre in the autumn. As part of the project, pupils from each of the schools have received a lecture on art and design from professionals at St. Enoch Centre’s creative design company, Curious. The youngsters were given advice on how to carry an artistic concept from initial conception through to completion. The six schools participating in It’s My Greener Glasgow are Govan High School, Bannerman High School, Hillhead High School, Lochend Community High, Springburn Academy and Notre Dame High School. “We are delighted to launch It’s My Greener Glasgow this year, as a follow up to two very successful years of It’s My Glasgow. “St. Enoch Centre is always looking for new ways to work with and strengthen ties with the local community, through supporting educational initiatives, providing unique forms of entertainment and ensuring first class shopping facilities. “It is such a pleasure to be working with a number of our local secondary schools on this project, which uses art as a channel for creative thought and encourages youngsters to think proactively about Glasgow’s environment. “It’s My Greener Glasgow is a great initiative and St. Enoch Centre deserves to be congratulated for its sustained support. “Young people are being given the opportunity to develop a broad range of valuable skills and attitudes through art and design, that will hopefully benefit Glasgow and its citizens as these young people begin to make their mark on the future. “In addition it will encourage and support the young artists and designers who will play an important part in shaping the environment we share. “A significant feature of the competition is that it supports many of the aims of Curriculum for Excellence. “In addition to presenting an exhibition of their finished work, participants must write a supporting proposal, explain the rationale behind their work, engage with professional designers and contribute as part of a team. 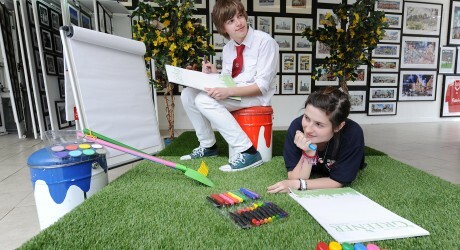 “Projects such as this help young people to build the attitudes and skills needed for the world of work, and to focus their attention on how to contribute to their society in responsible ways to whilst simultaneously being a fun, dynamic and creative way of learning about art, design and important environmental issues.